With today’s limited budgets and interstate highways and bridges reaching the end of their design life, it’s important for road owners to use advanced design methods and tools for developing pavement designs that meet a variety of service requirements. 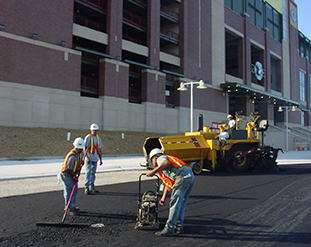 Pavements of all types—from driveways to highways—must be cost-effective to build and maintain and must provide long-lasting service. This publication presents a brief technical review of rolling resistance and examines how it impacts fuel economy. This document explains the underlying concepts and the principles for using life cycle cost analysis for pavement selection. LCCA best practices and common missteps are a must-read for pavement planners and local and county agencies. This publication articulates an appropriate and non-biased method for life-cycle cost analysis (LCCA) that follows guidelines from the Federal Highway Administration. In making any decision concerning the type of pavement to use on a roadway, a road agency is obligated to get the best value for the taxpayers. This report spells out considerations for making pavement type selection a user-oriented process, with a system that is objective, defensible, understandable, based on historical records, primarily driven by economics and periodically reviewed.